The king Nebuchadnezzar II had them built in order to try and cheer his wife. His wife, Amytis of Media was from Persia and grew homesick for the lush green and fragrant plants and trees of her homeland. Her husband wanted to bring her happiness. He felt by recreating the gardens that were similar to the ones in her homeland, that he could accomplish his goal. The Hanging Gardens were built in 600 B.C. on the banks of the Euphrates River. There are some people that believe that the exact location of the gardens have been lost through the ages and wonder if the gardens have not been confused with those of another nation. While these gardens were marvelous to the eyes of ancient historians like Strabo and Diodorus Siculus, there are several mysteries that have yet to be answered and proven. The first of these ancient mysteries is the actual size of the gardens. One ancient historian Herodotus claimed that the walls were fifty six miles in length, were three hundred twenty feet high and eighty feet thick. Contrary to this belief, archeological finds prove that the walls were only about ten miles in length and nowhere near that high. Still, the exact size of the Hanging Gardens of Babylon is believed to have been quite immense. The second mystery of this wonder of the world is how it was possible to water the entire garden. There are a number of theories that have been brought up. One such theory is the use of a chain pump. A second theory is the use of a device that very closely resembles an Archimedes screw. The area that the hanging gardens is believed to be built on is very dry and does not receive much rain. The fact that the gardens were built on the river is solution, but how did the water get from bottom to the top is still unexplained. 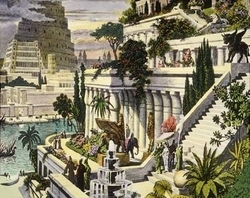 The third of these great mysteries is that of who really built the Hanging Gardens of Babylon. Though Nebuchadnezzar has received the credit, there are others that believe that Queen Semirami is actually the person responsible for the construction during her reign of five years starting in the year 810 B.C. These are great and truly marvelous mysteries just waiting to be answered. However, this day their secrets are kept in silence, waiting to be found. The Hanging Gardens of Babylon is much more than a beautifully landscaped area, or even a "wonder" of the world. The gardens are also one of the greatest unsolved mysteries of the world.